Introduced with Tears of Veeshan, the 26th Everquest II class is a bow using, leather wearing, pet commanding, healing Priest class. You must have the Tears of Veeshan expansion to unlock Channelers. Primary Stats: Wisdom and Stamina. Healing: Cure and rez. 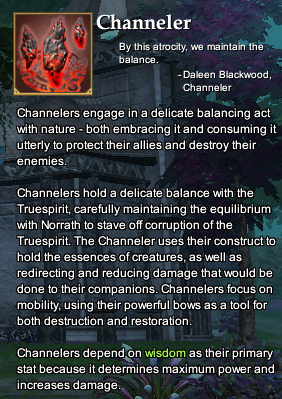 "Channel Soul" is a rez item you can give to allies. Casting: Can move while casting bow-based combat arts. Unique Pet: Has a Construct (golem) pet that can intercept damage. Not fully a pet class. Channeler's Sight: Allows Channeler to see what targets can have their essences taken. Channel Essence: Attempts to channel the target's essence. Must be in combat. Target must be below 25% or grey. Your construct is your constant companion. It is nearly invincible, and even the most devastating attacks will usually render it inoperable. It can absorb some of the damage of incoming attacks, and can bean the difference between life and death for you or an ally. - Moosk, Channeler Trainer, Neriak. The Construct uses a standard pet window. It reduces damage of group mates, which can be parsed. Its health is based on Channeler’s stats, which can be boosted by the Channeler leveling and increasing their own Crit Bonus and Potency. A Construct cannot die, it just stops absorbing damage at 25%, and gets worse at absorbing damage as his health drops. It can't be attacked by mobs, but can be in PvP. The Construct is unable to be healed by normal means - only the Channeler can heal it. Unlike Beastlord Warders, a Construct does not need to be skilled up. There are Alternate Advancedment choices available to Channelers that include some enhancments for your Construct. To access the Construct Window, first open the character window (C). After you've summoned your construct there will be a Construct tab, which is where you customize your construct's appearance. The Construct has 6 appearance slots and 4 ability slots. The top six buttons are appearance buttons. They have no bearing at all on anything you or the pet can do, they are purely cosmetic. You mix and match until you get a look you like. The four buttons on the bottom are the passive abilities related to the essences you have captured. Essences are obtained by using the Channel Essence ability out in the world; it can only be used if you are in combat and the target is under 25% health or of grey difficulty. They will add to the appearances and passive skills found in the Construct window. You can use the essences of animals to change the appearance and function of your construct. There are many creatures throughout our world, so I encourage you to experiment with them and see what suits your situation best. - Latinna Spiritgear, Channeler Trainer, Kelethin. Reported essences include: aquatic (crocodiles), avian, boar, bovid (hooved creatures like deer), canine, dire, drake, feline, rodent. Note that construct colors are spells; after you scribe them you'll find them in your Knowledge Book under Abilities. Some color appearances are available from the Channeler Trainers. The Dissonance Bar is on top, the Conduit hot bar is on the bottom. Conduits are your abilities. When you channel them, your Dissonance will grow. This increased Dissonance will disrupt your harmony with the Truespirit, and you will no longer be able to channel your Conduits. You are better served by keeping your Dissonance as low as possible in most circumstances. - Moosk, Channeler Trainer, Neriak. You gain access to your Conduit hotkeys and Dissonance bar at level 15. At first only the first two slots are available. While billed as having 10 slots, in beta the Conduit Bar had 8 slots. All your main construct Repair abilities can go in the first 2 slots. Slot 3 is reserved for emergency heal. Slot 4 is a debuff. Slots 5-8 are wildcards and can take anything not a Repair, Emergency Heal, or Debuff. Click any slot to chose between available options, but you cannot change anything on the Conduit bar while in combat. Dissonance is the equivalent of Savagery, in that it's a pool to power your special abilities. The more you use your conduits, the fuller your Dissonance bar gets: filling it will make you unable to cast until it naturally dissipates over time. near the Granite Hills Acorn Lift. near Arbos, the Elddar Tree in Elddar Grove. ZAM credits EQ2 Wire for some of the info in this article. This page last modified 2013-11-13 06:12:10.